Having a sense for its price – how much is the asset currently trading for? In this respect, the difference between the two will suggest that you are getting a good deal when the current price is below its fair value, and vice versa. Key to this process is an appreciation of having a “margin of safety” which is a buffer, or a layer of fat if you will, that still makes the investment worthy should your investment thesis be slightly misjudged. 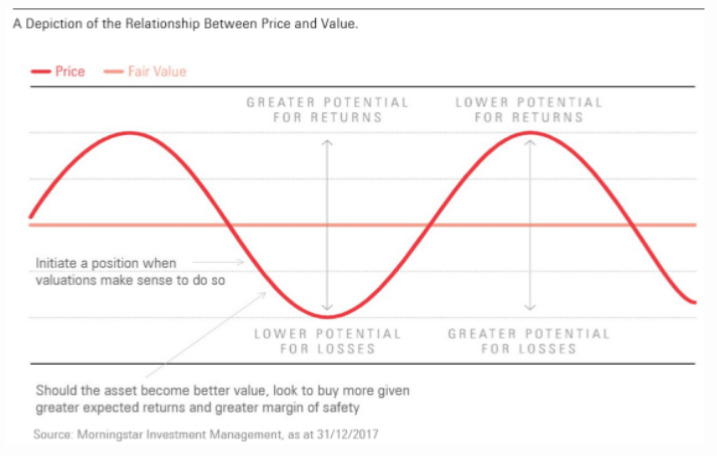 When the difference between price and fair value provides a sufficient margin of safety, that is the signal that it is time to invest. Consider for a moment, the circumstances that might lead to an asset’s price trading below its fair value. Quite often, this is an overreaction to some near-term headwind; perhaps it’s a sentimental change resulting from macroeconomic or geopolitical news. In this respect, it’s interesting to observe the concept of “quality” and how this may impact the intrinsic or fair value of an asset. By defining quality as the certainty of underlying cash-flows, we are really in the business of understanding how durable the cash-flows of an investment will be. A danger that we often see in this regard is short-termism. Many commentators will focus intently on the next 12-month, trying to predict the near-term earnings growth and then extrapolating that into a market direction. However, we caution against looking at such short-term prospects, as it is just too variable a data set to provide meaningful analysis, thereby encouraging irrational investor decision making. By contrast, analysis of longer-term cash-flow growth and risk to those cash flows provides a much more accurate assessment of quality, that is less vulnerable to unforeseeable changes in the market cycle. To bring this into practical terms, we have a bias towards investments that offer sustainable cash-flows, but typically only when the price is trading at a discount to those cash-flows. Said another way, it is not good enough to be high quality, as the prices must be justified. We therefore use both of these pillars, valuations and fundamental risk, to align how we invest as long-term investors. It is difficult to know with certainty how long it will take for an attractively priced asset to appreciate towards its fair value, however, as long-term investors, we are prepared to wait patiently for this to happen. Our positive view on Japanese equities, for instance, has largely stood for the best part of five years, despite a disappointing 2014, our patience and long-term approach has been rewarded. Other valuation-driven investment ideas may deliver value more promptly, but we are not in the game of predicting speed. For example, emerging market and European equities have begun to realise their potential after less than three years in our portfolios, while more recent investment themes, such as U.S. healthcare are showing encouraging signs, at an early stage. Regardless, the point is that, typically, value tends to be more prevalent in times of fear and uncertainty. Because it feels uncomfortable to hold an investment in the face of such overwhelming negative sentiment, investors often sell, without any regard for the price. This is an irrational behaviour, and one that has a destructive impact on achieving longer term investment goals. However, by anchoring investment decisions to value, we can navigate challenging circumstances and look through market noise and emotion to identify and take advantage of opportunities that may present in times of market stress. This often sees our views as contrarian to others in the market. It is important to realise that our decision to buy, when we have sufficient margin of safety to do so, may at times seem early and will not necessarily coincide with a reversal in the negative sentiment that created the opportunity in the first instance. Indeed, fear and uncertainty can persist for some time, potentially weighing further on the asset’s price. In this environment, with a greater margin of safety and greater expected returns on offer, we may look to buy more of the asset, assuming, of course, that the quality of the cash flows has not deteriorated during this period. If we are right, over time, poor sentiment will fade, clearing the way for the asset to appreciate towards its fair value. 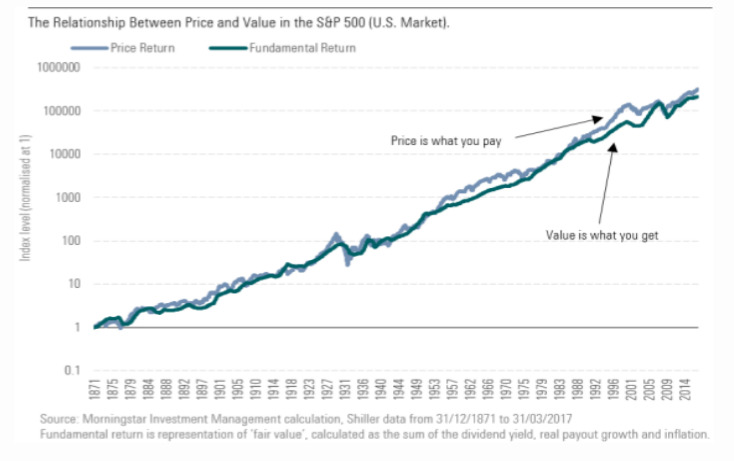 We have a profound belief that the key driver of investment returns is the price you pay relative to the quality of the underlying cash-flows. Buy something that is fundamentally sound but cheap, and you stand to be well rewarded; purchase something that is expensive or fundamentally risky, and returns tend to be subjected to a greater likelihood of loss. Often, the opportunity to buy better-valued assets comes from overreaction to a short-term headwind that creates a long-term valuation opportunity. While often this headwind is accompanied by extremely poor sentiment, the challenge is to understand how much of the bad news is being priced into the investment and to gauge whether the qualities of the underlying cash flows are resilient enough to see through the turmoil. You can read the full article at Morningstar here. The original article is published by Johnny Hopkins, appears on acquirersmultiple.com and is available here.